The Topper is a lightweight but rugged single-handed, easily rigged, low maintenance one-design dinghy that can be transported on the top of a car. It has very simple sail controls and is built from polypropylene rendering it virtually indestructible! Great for learning, skills development and fun to sail! The recommended weight range for Juniors with a ‘5.3’ sail is 45-65kg . A smaller ‘4.2’ sail is available for lighter sailors or for windier conditions! For adults, ability and confidence are more relevant than weight. Toppers give our junior members a popular versatile single-handed option. The Topper, however is not just for youngsters, it is also a great boat for adults who are not heavy enough, or strong enough, to feel confident in a Laser Radial. For beginners there is a wide range of club and ISA-accredited Junior sailing courses to choose from. We run regular open sailing, coaching and ‘start to race’ sessions for those who have advanced. 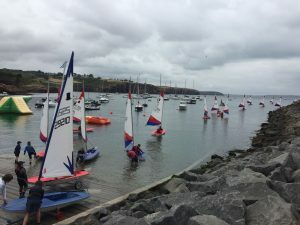 Finally, Topper sailors have dinghy races on Wednesday evenings and Saturday afternoons in summer months. Almost every year we host a Topper ‘Traveller’ or the Topper Southern Championships. Topper sailors of all age groups from all over Ireland join us in training and competitive racing. We will host the 2019 Topper Southern Championships on June 22nd and 23rd. It is expected that over 60 Toppers will participate. Finally, our members frequently participate in events at other clubs, national competitions at home and abroad and occasionally even at “The Worlds”. A used entry-level boat can be acquired from as little as €500. A used competitive racing-ready boat can be acquired for about €1,500 but prices vary widely! We have some club owned boats that may be rented for members’ use. See here for more details. Do come and join our friendly club fleet. We will be happy to provide both practical advice and encouragement whether you would like to sail, race or even just try sailing a Topper.